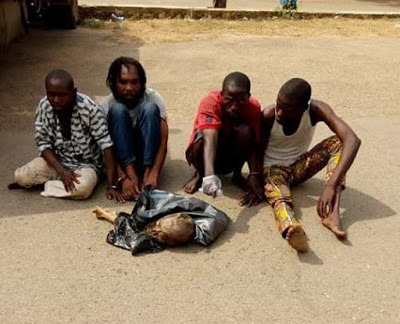 The Oyo State Police Command on Thursday paraded four suspects, who were caught with Human parts in the Ayegun area of Ibadan. The suspects include an Islamic cleric (Alfa) Sulaiman Hamed, 35, Tope Akinyele, 45, who claimed to be the pastor of a church in Ojagbo, in the Oranyan area of Ibadan and and two other accomplices, Olapade Saheed, 32, and Olatunji Abiodun, 26. Briefing newsmen at the Command headquarters, the state Commissioner of Police, Abiodun Odude , said the Alfa, participated in the Fidau prayers for a dead man but later paid Saheed and Abiodun N2,500, to exhume the corpse because he needed the body parts for making money charm for his clients. Saheed and Abiodun were later caught with the deceased’s head and other body parts, leading to the arrest of Hamed and Akinyele. "Someone introduced Saheed and Abiodun to me. I gave them N2,500 to help me find Human Flesh. We all met at Ayegun junction, Ibadan," said the Alfa. "Around 10 pm , I took them to a grave where a body that was brought from Warri , Delta State, was buried. I took part in the prayers for the deceased before he was buried. I left them ( Saheed and Abiodun) there, but they refused to let me go. They said they wanted to sleep in my house that night. I got them a place close to my house. “I use human flesh to make money ritual for people and I pay N2 ,500 for the flesh. In this case , the charm was for myself . I did not ask them to cut off the head and it was not in my possession when the police came." Saheed admitted that the Alfa paid them N1,500 to do the job and that he took them to the grave of the deceased. “Alfa called us for a job at Ayegun. When we got there, he showed us a grave three houses away from his house. After we finished the job, he took what he needed from the remains of the dead man and asked us to dispose of the rest. "We left early in the morning. But on our way , a local vigilance group stopped us and asked what was in the bag we carried. They beat us up after realising that there was a human head and other body parts in the bag. The police later came to arrest us,” he said.